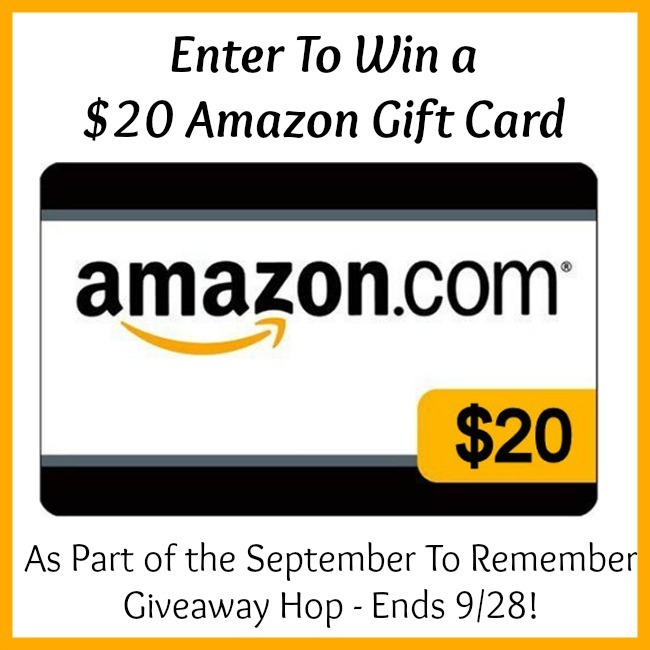 Welcome to the Unbe-LEAF-Able September To Remember giveaway hop! This is sure to be a fun giveaway hop where you can win lots of great prizes. 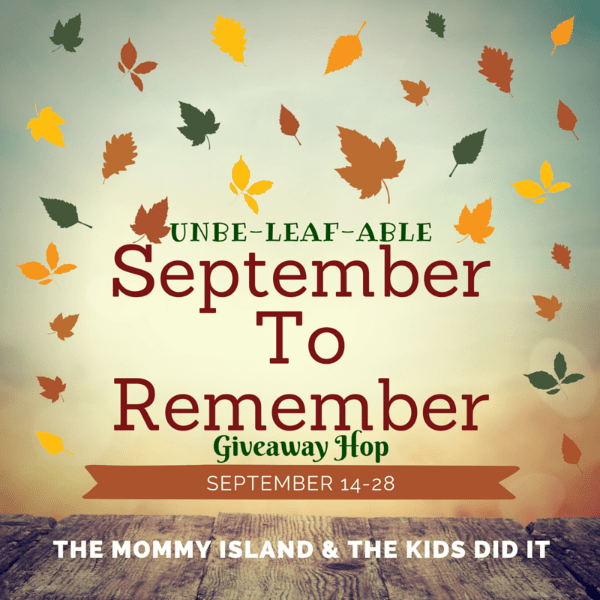 The Kids Did It and The Mommy Island are so kind to host this giveaway hop. I would spend this gift card on some new Adidas socks for my grandsons. id use it on something boring like toilet paper hahaha… im old! I would buy a Christmas present so I could get my shopping started. I’ll spend it on headphones. It might sound weird but I am in need of purchasing a new pair of compression stockings and Amazon has a good price but still they are expensive and this would help towards that purchase. I would spend the money on running shoes. I would put it towards k-cups that I always stock up on for the fall and winter. Amazon is the best place to buy them! hmm I’d probably spend it on some music cds. I am going to save it for the Cyber-Monday sales. I’ll get some spooky DVDS for Halloween. I would put it towards a new jacket! I would purchase a couple of ebooks. I’d use the gift card for school supplies. If I won I would use the gift card to buy one of my kids a gift for Christmas. Thanks for the chance! I would probably spend this gift card on a couple organizer racks for my kitchen! I’m badly in need of some organization in my apartment! I would pick up some new iPhone and Android fast-charging data cables and a few multi-port usb chargers. I would use it to rent some movies this winter. I love shopping on Amazon, I would put towards upcoming Christmas shopping. I would use it on ink for my printer. I would use it on a laptop. I would put the GC toward family birthday gifts. I need to replace my laptop, I have been trying to save money, so I would use it toward replacing mine. I will use the Amazon gift card to buy some hard-to-find baking products. I would purchase get some great deals on Blu-rays. If I won, I’d put this towards buying my dad a smartphone! I would spend it on something for one of my girls for Christmas. Thank you! I would spend this gift card on a special gift for my grandson . I will put it towards an infant insert for the Tula carrier I bought for our new grandchild. We have so many fall birthdays coming up so it will most likely go towards presents! I would spend the gift card on HD movie downloads! I would just add it to our gift card balance for something we occasionally need. I would put it towards audio books. I’ve been eyeing some flats and low wedge shoes for work. I would probably spend it on a photography backdrop! Thank you for the chance to win! I would use it to buy some headphones for my husband and I. Cute winter crochet boots ive had my eye on ! I would spend it on books for my brother! I would use it on kcup. I would use it on books. If I won, I would put the gift card towards some new workout clothes! I would put it towards laundry cleaning items I want to get. I will buy a game for my grandson. I would put it on my son’s account. He is saving for a new monitor. I would buy my son a power rangers toy. I would use it toward my oldest daughter’s textbooks for next semester. I would use it to buy a book for my daughter from her “wish” list on Amazon for Christmas. I would use it toward getting a new book shelf. I would use it for books for my sons! I am saving up for a deep fryer, with this, I could get it! I’ll get some mint mocha Kcups… Tis the season! I would get my son a new winter coat. I would probably get some digital movies/shows. We are moving in May so I really don’t want to get more physical things to move if I can help it. I would buy books for my grandsons. I would use it to order diapers for the little one. I would use the gift card to help purchase some new winter bedding. I would like to gift it for a Christmas gift. New shoes would be wonderful! I would use the gift card to buy Beauty and The Beast. If I win, this GC will go toward Christmas gifts for my twelve grandkids. I know it won’t buy all twelve gifts, but it will help a lot! If I won I would feed my hungry, hungry Kindle Fire! I would put it towards a new tablet for my son for Christmas. It would go towards Halloween candy and glow bracelets for the trick or treaters! I’d use it to get a 100 pack of gel pens for my coloring with that I’ve had my eye on! I would spend my gift card on books. I would put it towards my mother and father’s Anniversary gift. I’d love to get the Hamilton soundtrack! I would spend it on Maine Lobster.